I’ve been selling used books online as a full-time job since early 2003, but I never said it’s a perfect business. I’ve been studying about passive income streams and so-called “very small business” models recently. While I’m grateful for the income stream online bookselling provides me, there are four reasons I hesitate to recommend it to others. 1. It’s not consistent. While my income from used bookselling is pretty nice in August and decent in May (when I’m well-stocked — and I’m not this year), a month like October, when sales are very slow, is depressing. It’s sometimes hard to pay bills that come regularly with my irregular income. While these seasonal swings can be predicted, booksellers took a hit from the economic downturn, too, something we could not have predicted. And sometimes sales slow down without explanation. Inventory sources aren’t predictable, either. That means I can’t always keep as much inventory on hand as I’d like, and that decreases income, too. 2. It’s not on the upswing. I’ve been reading posts on book-related message boards for years suggesting the end is near for booksellers, and they’re all wrong. Buying and selling used books is a trade that will continue for decades — perhaps centuries. But the opportunities aren’t increasing for online booksellers. Some school and universities are moving to digital books, and so are some casual readers. Publishers are tightening up print runs so there aren’t so many unsold new books available to the used book market. Some information is being published directly to the web that would have once become a book. Yet sellers are still flocking to the business, undercutting others and driving prices down. Of course, a business doesn’t need to be growing to provide a nice income, but it’s nicer to get into a business when it’s booming (as I did with bookselling) than when it’s floundering (as bookselling could soon be). 3. It’s not location independent. Some young entrepreneurs insist that the most viable small businesses sell only services and digital products, making the business owner free to move about the country — or the world. But books have to be stored somewhere, and you (or someone) must be there, too. Location independence may not be important to you, though. I’m not completely satisfied with my living situation, but because I have a partner (I actually had to pause a moment to think what they’re called now), some cats, a little family and a few friends, I’m happy to stay close to home — most of the time. 4. It’s not completely passive. I like the idea of passive income — making money while you’re doing something else — and bookselling is only partially passive. Sales happen without me. Orders show up while I’m asleep or at a concert just as simply as when I’m at my desk. But every item that sells has to be carefully inspected, cleaned, listed and stored. Then, it must be pulled, packaged and mailed. Because bookselling isn’t completely passive, booksellers sometimes need assistants or helpers, so that means it isn’t the perfect very small, one-person business. Actually, I can probably think of several more reasons bookselling isn’t a perfect business model for the future, but there’s no need to torture myself. I depend on my bookselling income, so I’ll be at it for a long time to come. But it isn’t the only iron I have in the fire. I tried this while in college and it was definitely not a minimalist business as Everett Bogue would say. I was reading Everett’s blog when your comment came in. I didn’t know you tried bookselling. 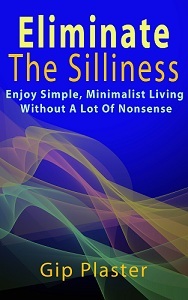 No, it’s not minimalist, but it is fairly simple. For a long time, it was a very easy way to make money. It’s not as easy now. And I think I’m simply read to move on.